I've been reading and grading final papers and exams for the past week, and in amidst that I saved the last vestiges of my mind by reading Steiner, a writer I've binged on in the past, but hadn't read in a few years. The New Directions collection proved to be a delightful way to revisit his work. It surprises me that I like Steiner's writings as much as I do -- he is an avowed devotee of, primarily, the classics of European literature; he has shown mostly contempt for the methods that have come to be called literary theory and cultural studies; he's particularly interested in Greek and Roman languages and mythologies. I, meanwhile, spend about half my reading time with popular fiction; I'm rather fond, depending on my mood, of such writers as Roland Barthes, Jacques Derrida, and Michel Foucault and am in general sympathy with some of the tendencies within what gets labelled as New Historicism and Queer Theory; I have very little interest in Greek and Roman history or literature and even less interest in mythology. Additionally, I am fluent only with English, while Steiner's second book, The Death of Tragedy, begins by noting that "All translations from French, German, and Italian are by the author" and one of Steiner's best-known works is After Babel: Aspects of Language and Translation. He is not I. There is enough poly in the math of Steiner, though, that some of his passions are ones I share -- for much of Modernism in its various forms and modes, for Shakespeare and the Russians and Kafka and Beckett and Celan and Borges, for the ethics of language and literature in an age of atrocity. Additionally, and perhaps most importantly, Steiner is a marvelous writer. His sentences and paragraphs are rich not only with ideas and information, but music. George Steiner at the New Yorker provides a good general overview of Steiner's primary obsessions and themes over the years, making it a fine companion to, especially, such previous works as Errata: An Examined Life and My Unwritten Books (also from New Directions, and adorned with one of my favorite covers of recent years). There are essays on Beckett, Borges, Brecht, Bertrand Russell, Noam Chomsky, Simone Weil, Claude Lévi-Strauss, Walter Benjamin, and Albert Speer. There are surprises, too: one of the most impressive and elegant essays is the first, "The Cleric of Treason", about Anthony Blunt, espionage, homosexuality, and scholarship. There are insightful pieces on 1984 and 1984, on Graham Greene, on Thomas Bernhard, on the OED, and on chess. Perhaps most surprising of all, there is a basically positive review of Zen and the Art of Motorcycle Maintenance. There is a great book to be written. It would show that the twentieth century as we have lived it in the West is, in essential ways, an Austro-Hungarian product and export. We conduct our inward lives in or in conflict with a landscape mapped by Freud and his disciples and dissenters. Our philosophy and the central place we assign to language in the study of human thought derive from Wittgenstein and the Vienna school of logical positivism. The novel after Joyce is, in the main, divided between the two poles of introspective narration and lyric experiment defined by Musil and by Broch. Our music follows two great currents: that of Bruckner, Mahler, and Bartók on the one hand; that of Schoenberg, Alban Berg, and Anton Webern on the other. Though the role of Paris was, of course, vital, it is now increasingly clear that certain sources of aesthetic modernism, from Art Deco to Action painting, can be found in the Viennese Jugendstil and in Austrian Expressionism. The functionalist, antiseptic ideals so prominent in today's architecture were predicted in the work of Adolf Loos. Political-social satire in London and New York, the sick joke, the conviction that the language of those who govern us is a poisonous smoke screen echo the genius of Karl Kraus. Ernst Mach had a profound influence on the development of Einstein's thinking. The logic and sociology of the natural sciences cannot be formulated without reference to Karl Popper. And where shall we place the manifold effects of Schumpeter, Hayek, von Neumann? One could prolong the roll call. A reader who has encountered that paragraph and been intrigued will find ideas from it scattered and blooming throughout Steiner's oeuvre in fascinating ways -- the essay on Kraus and Thomas Bernhard in this book, the material about his Viennese parents and Judaism in Errata, the essay "A Kind of Survivor" in Language and Silence. Other connections pop up throughout many of the other pieces in the collection -- "The Tongues of Man" (from 1969, about Noam Chomsky's linguistics) points toward After Babel and a 1974 essay in On Difficulty, "Whorf, Chomsky, and the Student of Literature". Et cetera, et cetera. There is throughout Cioran's jeremiads an ominous facility. It requires no sustained analytic thought, no closeness or clarity of argument to pontificate on the "rottenness," on the "gangrene," of man, and on the terminal cancer of history. The pages on which I have drawn not only are easy to write, they flatter the writer with the tenebrous incense of the oracular. One need only turn to the work of Tocqueville, of Henry Adams, or of Schopenhauer to see the drastic difference. These are masters of a clairvoyant sadness no less comprehensive than Cioran's. Their reading of history is no rosier. But the cases they put are scrupulously argued, not declaimed; they are informed, at each node and articulation of proposal, with a just sense of the complex, contradictory nature of historical evidence. The doubts expressed by those thinkers, the qualifications brought to their own persuasions honor the reader. They call not for numbed assent or complaisant echo but for reexamination and criticism. Books do continue to be produced and published in large numbers. Handwritten illuminated manuscripts continued to be produced well after Gutenberg. Periods of transition are difficult to make out. They are also intensely stimulating. One can intuit deep-lying seismic shocks affecting our cultural perceptions of time, of individual death. These will put in question the claims of literature, of written thought, to individual glory, to survival "for all ages." Milton held a good book to be the "lifeblood of a master spirit." Doubtless this precious liquor will continue to flow, but, perhaps, in altogether different channels and test tubes. The boys and girls at their computer keyboards, finding, stumbling onto insights in logic, in fractals, may neither read nor write in any "book sense." Are they illiterate? 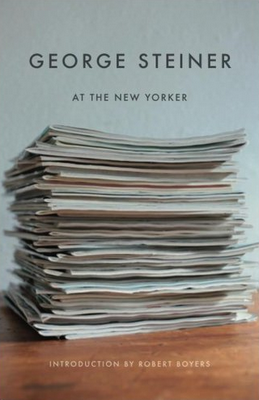 As a boy at a computer keyboard, I will simply say here that George Steiner at the New Yorker -- even with twenty-eight essays instead of fifty-three! -- makes me grateful for the bits of my own literacy that have made the book such a pleasure over the past week, and grateful for the greater, and generous, literacy of George Steiner, who continues to make the idea of a literate life itself seem like something to be aspired to more than something ever truly to be attained. We must keep learning, writing, reading.